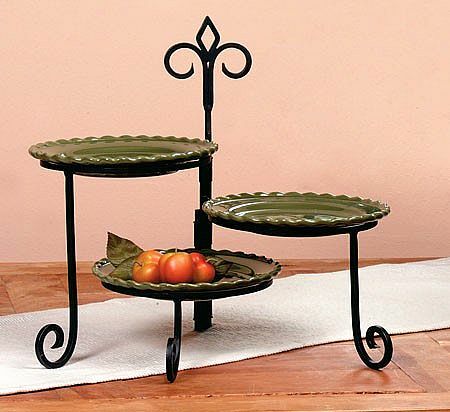 From our very popular Keller Collection, this 3 tier swivel plate stand is now available in a money saving set of three! Save over $15 on three stands when you purchase in this set. 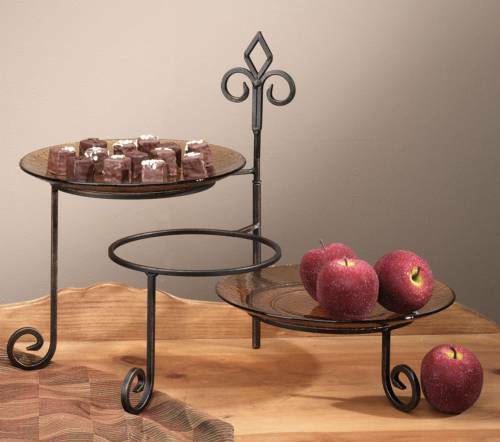 Perfect for your party buffet table to hold appetizers, or just as great on your kitchen or deli counter with fruits and vegetables! Its black finish with gold accents gives it an understated flair, so it doesn't take away from your display, but doesn't fade into the background either! Popular with event planners, it makes for a wonderful dessert or pastry display at weddings and special events! But don't be afraid to use it just to hold your own collection of decorative plates with nothing on them! Measuring in at 12 1/2"W x 8 1/4"D x 15"H, this tiered swivel stand holds plate sizes 8 1/4" - 11" in diameter.